1. Make the beef tenderloin marinade by combining Lee Kum Kee Premium Soy Sauce, vinegar, ginger, garlic, Lee Kum Kee Sesame Oil, olive oil, sugar, salt, and ground black pepper in a large bowl. Mix well. 2. Add the cubed beef tenderloin on the bowl with the beef tenderloin marinade. Gently toss to coat the beef. Let it stay for 1 hour. 3. Using a metal or bamboo skewer, assemble the beef kebob by skewering the vegetables and marinated beef tenderloin. 4. 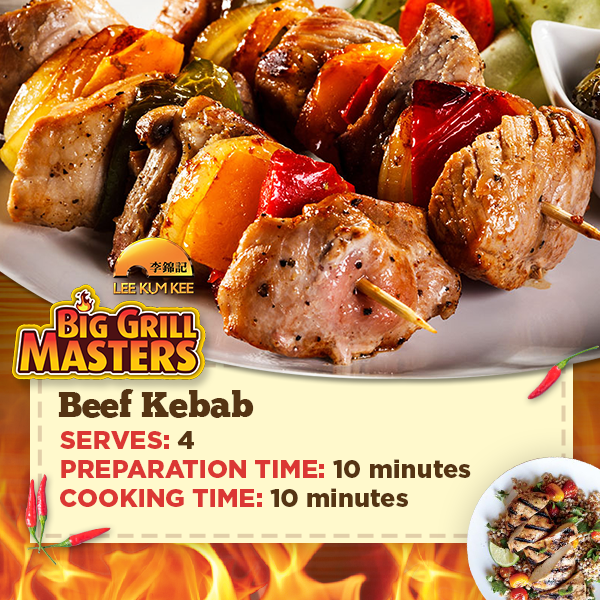 Heat-up the grill and start grilling the beef kebobs for 3 minutes per side. This will give you a medium beef that is juicy and tender in the inside. Add more time if you want your beef well done, but it will be less tender. 5. Transfer to a serving plate. Serve with Saffron rice.